Happy Easter, everyone! I hope you have the most amazing choc-filled day. I know I am! Oh, how I love an excuse to pig out on chocolate. All day. There's no judging during Easter, right? Phew. Anyway, we're having a barbecue this evening with most of my Mum's family coming so I thought it would be nice to try and do some basic nail art. I'm trying to get a little more adventurous with my nail polish etc. so why not? My little cousins (girls, 9 and 7) are coming and they love all things girly, so I think they'll really like it also. Little story: My nephew (almost three) has taken to walking into my room, selecting a nail polish colour (he considers his options, let me tell you!) and bringing it to me saying "Sophie, can you put this on my fingers? Preasseee?" Now I'm sure his father wouldn't appreciate this so I always find a way to distract him but I bet he wants bunnies today! Anyway, here's what I came up with. It's not super detailed or intricate but, given it's my first attempt at such nail art, I'm still pretty proud! If you want to find out how I created this nail look, keep reading! Firstly you want to remove your nail polish. That probably goes without saying but yeah. At this step I also shape and smooth my nails using the Sally Hansen No More Ridges nail file. I don't normally use products like this but this one really impressed me. Next I applied my nail treatment and base coat as normal. 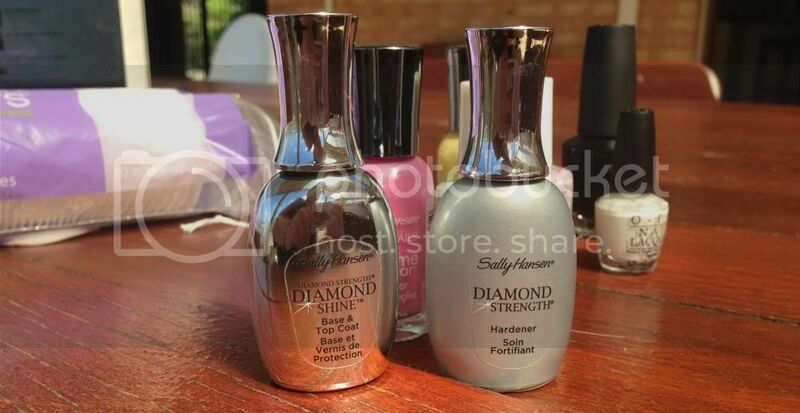 At the moment I am using Sally Hansen's Diamond Strength Hardener and her Diamond Shine Base & Top Coat. I must admit I prefer the Sally Hansen Miracle Cure Nail Strengthener but the Diamond Strength Hardener was cheap. Next, it's time to paint your nail base colours. I chose pastel(ish) shades, purely because they're the typical Easter colours. I've used Ulta3 Corsican Rose, Ulta3 Lilac Bloom, Sally Hansen Hard As Nails Xtreme Wear Nail Colour #470 Bubblegum Pink, Sally Hansen Hard As Nails Xtreme Wear Nail Colour #360 Mellow Yellow and Ulta3 Soft Hydrangea. I didn't keep to a real pattern, panting each nail a different colour. I also didn't keep the order the same on each hand. Mix it up! To finish off this part of the manicure, I touch up the edges with nail polish remover on a cotton tip. I then used my Essence Quick Dry Top Coat to seal everything (purely because I dries faster than the Sally Hansen Diamond Shine Base & Top Coat). Given that I'd be using my hands to paint the bunnies, I wanted to know that they polish would be dry so I applied the Essence Nail Art Express Dry Drops to my four fingers (not the thumbs). To create the bunnies, I started by applying white nail polish to the the tip of my nail in a semi circle shape. You want the white to be an okay size because it needs to fit a nose and two eyes, but you also want to leave enough base colour so you can fit the ears. I did two coat of this white to ensure it was quite opaque. And here's where I forgot to take any more photos. Oops. I think I just got too into the whole process. I've edited the above image, however, to show you what I was going! To give your bunny ears, you want to paint two lines on the nail, going across the base colour (in my case it's blue) and the white semi circle. Now it's time for the detail on the bunny. Firstly, use the brush of your nail polish to place a little of your pink and black nail polish on a piece of card or some kind of mixing palette. To give your ears some definition, place a pink in the middle of the ears, as you can see above. Also dot a little in the middle of the tip of the nail to create a nose. Next it's time for the eyes. Yep, this bunny needs to be able to see! The eyes are super easy. Dot your toothpick in the black polish and then onto the nail. Then that's it. You're done! To ensure everything that dry I applied two drops of the Essence Nail Art Express Dry Drops to each thumb. Anyway, I'm pretty proud of these nails! It's my first attempt at something like this and I can't wait to see what else I'll be trying in the future. If you have any cool (and really easy) nail ideas, please let me know. Once again, have a fantastic Easter and, all you Australians, I hope you're enjoying your long weekend! What are you doing this weekend? Have you got special Easter plans? Let me know!